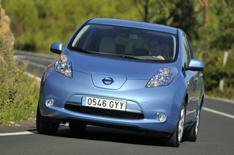 Is 2011 the year of electric cars? | What Car? Is 2011 the year of electric cars? Will this year change the market for electric cars? That's the question being posed by the Low Carbon Vehicle Partnership (LowCVP) in a webinar to be held next week. Guest speakers in the webinar include What Car? editor-in-chief Steve Fowler and Michael Hurwitz, director of the Government's Office for Low Emission Vehicles (OLEV). The event will be chaired by Greg Archer, LowCVP's managing director, and there will be an opportunity for questions and answers during the webinar, which takes place on Thursday February 10 between 2 and 3pm. For those who are unable to attend at the scheduled time, the event will be recorded and made available to watch/listen again. Places are limited, so to register click here.